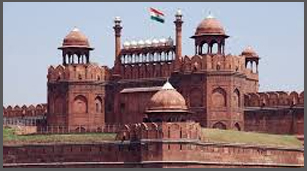 Red Fort or Lal Quila as it is more popularly known is a masterpiece of architecture and one of the most haunting spots for tourists from both India and abroad. This colossal fort on the banks of the river Yamuna, built by Shahjahan as the citadel of the 17th Century Delhi is a significant link between the past and the present, for it is from here that the prime minister of India addresses the people on the Independence Day (August 15th). Mughal Emperor Shahjahan started construction of the Red Fort in 1638, which was completed in 1648. The fort contains - halls of public and private audience, domed and arched marble palaces, plush private apartments, a mosque and elaborately designed gardens. Even today, the fort continues to be an impressive evidence to Mughal grandeur. The Red Fort with thick red sandstone walls, bulging with turrets and bastions is one of the largest and oldest monument in Delhi India. The Fort rises above a wide dry moat in the northeast corner of the original city of Shahjahanabad, now Old Delhi. Its walls extend from 2 kms and vary in height from 18 m on the river side to 33 m on the city side. The Fort also houses the Diwan-i-Am or the Hall of Public Audiences where the Emperor would sit and hear complaints of the common folks. The Diwan-i-Khas is the hall of private audiences where the Emperor held private meetings. This hall is made of marble and its centre-piece used to be the Peacock Throne, which was carried away to Iran by Nadir Shah in 1739. The other attractions within this monument are the Royal Baths or hammams, the Shahi Burj, which used to be Shahjahan's private working area and the Moti Masjid or the Pearl Mosque, built by Aurangzeb for his personal use. The Rang Mahal or the "Palace of Colours" housed the Emperor's wives and mistresses. This palace was crowned with gilded turrets, delicately painted and decorated with an intricate mosaic of mirrors, and a ceiling overlaid with gold and silver that was reflected in a central pool in the marble floor. Visiting Time : The Red Fort is open daily from Tuesdays to Sundays from sunrise to sunset, between 9.30 am to 4.30 pm. Entry Fee : Entry tickets to the fort cost Rs 10 per person (for Indian nationals) and Rs 150 per person (for foreign nationals). Entry to the fort is free on Fridays. Went to Visit : Best time to visit Delhi is between October and March, when the weather is very pleasant. Shaped like a Lotus, the Lotus Temple also know as the Bahai Temple is the most wonderful modern marvel of 20th century India. Open to all, the Lotus Temple is an ideal place for peace and meditation. Red Fort - Delhi Qutub Minar was the first Islamic structure Built in India. 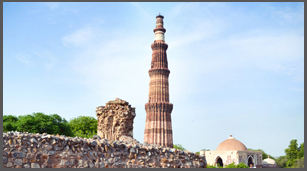 One of the most visited tourist spot of Delhi, Qutub Minar was built in 1199 by Qutub-ud-Din. . It is 72.5 metres high and one has to climb 379 steps to get to the top. The diameter of the base is 14.3 metres while the top floor measures 2.7 metres in diameter. India Gate is a majestic high arch, 42 meters high, built as a memorial to the Indian soldiers killed in the World War I. The surrounding area is an ideal place for spending sometime with family and friends. Air : The temple is located in New Delhi so reaching it won't be a problem. Rail : Delhi has two railheads - New Delhi Railway Station and Old Delhi Railway Station, both of which is connected to rest of India by several trains. Road : Delhi has well defined road and can be reached from nearby place very easily.